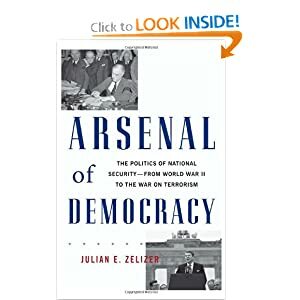 Mr. Zelizer, Professor of History and Public Affairs, Princeton University, is the author of Arsenal of Democracy: The Politics of National Security from World War II to the War on Terrorism (Basic Books, 2010). The book examines the political history of national security from World War II through the war on terrorism. While many scholars have acknowledged that politics has never stopped at the water’s edge, we don’t have many good histories of the subject. This work offers a synthetic narrative that examines how the issue of national security was integral to domestic political struggles as well as the ways in which political pressures shaped the national security policymaking environment. I don’t argue that policymakers have always been motivated by political concerns but I do show how political pressure profoundly shaped the environment within which they operated. Four recurring themes shape the narrative: the tension between executive and legislative power; the struggle between Democrats and Republicans to gain the advantage on national security; the debate over how much government should be expanded in pursuit of national security; and finally the debate over unilateralism versus multilateralism. The story examines the fragility of the political coalition that formed around liberal internationalism in the 1940s as well as the institutional and ideological challenges that conservatives faced after the 1970s when trying to enact their agenda. The most important factor was 9/11. I was finishing another book about congressional reform, On Capitol Hill: The Struggle to Reform Congress and Its Consequences, 1945-2000, when 9/11 took place. Living through one of the worst national security crises in American history, and watching the intense political fights that followed, motivated me to look back in time. That is my intellectual instinct of course. In the year that followed the tragic event, what surprised me was just how quickly the political battles over counterterrorism emerged. In some ways, the political battles remained the same. As more critics started to complain about how national security had become more politicized than ever before in history, I wanted to better understand if those claims were true. I was also interested in applying some of the insights from my other work, such as on the legislative process after the 1970s and on the history of conservatism, to national security. Too often national security is treated as some kind of an exceptional issue. But the deeper I got into the research, the more I saw that the same political processes—such as polarization in national politics—and the same developmental forces—such as the rise of the conservative movement—shaped this area of policy as well. How did you undertake the research for the book? The work is a combination of archival research and secondary reading on the key issues in this period. Based on research in 23 archival collections, I looked at familiar events and tried to understand the political context within which they took place. The archives were really fantastic. I found wonderful material at Harry Truman’s presidential library, for instance, about the political concerns that emerged about the Republican Right with regards to foreign policy in Asia and terrific memos at Ronald Reagan’s presidential library about the administration’s fears in the early 1980s of the political impact that the nuclear freeze movement was having on public opinion. What was the biggest surprise in your research? The chapter that really took me by surprise is the one that focuses on the Cuban Missile Crisis. When I went to the JFK Library, I really expected to start my chapter in the middle of October 1962 when most of the traditional accounts start. But as I started to do my research, it quickly became apparent that the story started in July and August 1962, when Republicans were making Cuba—and allegations that the Soviets were placing missiles in Cuba—a central issue for the midterm campaigns. The chapter examines the heated political atmosphere that surrounded JFK’s historic diplomatic decisions. Does the book offer lessons for President Obama’s administration? It certainly does. Obviously, with the recent decisions to escalate America’s involvement in Vietnam, the chapter about President Lyndon Johnson and the expansion of America’s war in Vietnam is one of the most haunting. In this chapter, we can see how Johnson, who came out of the fierce political battles of the 1940s and 1950s—over Who Lost China? and the stalemate in Korea—felt pressured when faced with calls to withdraw. With many advisors and colleagues warning Johnson against the military operation, the president insisted on moving in a direction that proved disastrous. In another chapter, I look at the difficulties conservatives encountered after they were in power in the 1980s. They had trouble implementing much of their hawkish agenda as they could not simply overturn the institutional and ideological legacies of the 1960s. Similarly, President Obama has found it challenging to fulfill many of his campaign promises to overturn key components of President George W. Bush’s war on terrorism. Who is the intended audience of your book? The book is published by Basic Books, a trade publisher. So the book is a narrative history aimed at general readers who want to learn more about politics and history. At the same time, I am hoping that the book reaches political and diplomatic historians as well as their students. As Fredrik Logevall has argued in recent years, one of the great historiographical tragedies has been the separation of political from diplomatic history since the 1960s (before that time, particularly in studies about World War I and the Cold War, the earlier generation of historians were much more interested in this connection though their work trailed off in the 1950s). Through this book, I hope to bring the two fields together. I also anticipate that the work will be of interest to scholars of American Political Development who have also devoted insufficient attention to national security. My ambition is that by offering a history of the politics of these issues within the U.S., Arsenal of Democracy offers a useful complement to brilliant works such as George Herring’s, From Colony to Superpower: U.S. Foreign Relations Since 1776.